Friday, June 13, 2003, marked a milestone in Chinmaya Mission Boston history with the inauguration of its new centre, "Chinmaya Maruti". Pujya Guruji Swami Tejomayananda presided over the idol installation ceremony of Lord Maruti (Hanuman) and his talks on Hanumanji were the highlights of the event. The 12,000 sq ft brick building is situated on a 2.5-acre lot with a beautiful wooded backyard that gently slides down to the flowing Shawsheen River. 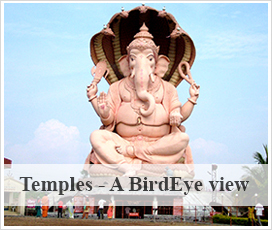 An image of Lord Ganesha greets devotees, as do the life-size photos of Param Pujya Swami Tapovanam and Pujya Gurudev Swami Chinmayananda. A few steps below the lobby is the shrine where the main deity, Lord Hanuman resides with Rama Parivara made of pancha dhatu (five metals), a Shiva Linga and Nandi, and Pujya Gurudev's padukas. Clear glass separates the sanctorum from the main hall. The idol is made of white marble. Looking at Hanumanji's most attractive face with a hint of a smile one is overcome with a feeling of peace and quiet. He instills all who worship him with fearlessness. Chinmaya Maruti has 24-carat gold leaf ornaments with gold trimmed beautifully coloured clothes and a pastel coloured garland. Hanumanji's utsav murti, 2 ft high with hands folded and made of pancha dhatu is used for regular abhishek. Daily worship and special pujas are performed in the shrine. 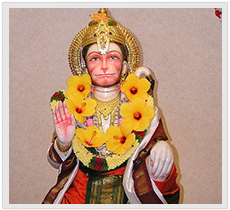 Hanuman Abhishekam is on every Tuesday and Guru Paduka Puja on every alternate Thursday.